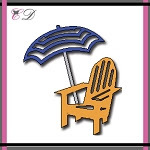 Gloria here today, I want to share with you a card using Beach Chair die from Cheapo dies. To create this card first, I blended blue color with Distress Oxide inks using mini blending tool and added some water splatters all over the panel. I tore a natural colored card stock to express a sandy beach. I die cut the Beach chair with with card stock and die cut the background using Unbranded dotted rectangle die. Mounted all elements as shown a top-fold card using double sided tape. Wow another stunning card, love the colors and cheerfulness of this card....and the twine, too!